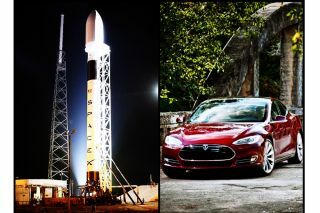 What Do SpaceX and Tesla Have in Common? What could a rocket company and an electric carmaker possibly have in common? At first glance, perhaps not much, unless the companies are SpaceX and Tesla Motors, which were both co-founded by the serial entrepreneur Elon Musk. At a NASA news conference held after the successful launch of SpaceX's Falcon 9 rocket earlier this week, Musk talked about the cross-pollination that goes on between his two companies. SpaceX and Tesla occasionally share test facilities, but the cooperation goes deeper than that, Musk revealed. Because of the technical requirements involved in lifting a rocket into space, SpaceX engineers are experts at creating lightweight vehicles using advanced materials. Some of this expertise has trickled down to Tesla's vehicles, Musk said. "For example, the Tesla Model S has an aluminum body chassis. In fact, it's the only all-aluminum car made in North America," he added. Similarly, SpaceX's vehicles — including the company's Dragon space capsule —benefits from Tesla's battery research. "SpaceX is able to leverage the Tesla technology there," he said. Musk said he also thinks there is much SpaceX could learn from the automotive industry in general. "If you think about it, a car is a human-rated vehicle that has to last for 15 years and 200,000 miles. And at the end of that, if you're in a crash, the air bags have to deploy and work perfectly," he said. "And yet, a car costs only a few tens of thousands [of dollars]. That's pretty incredible, what the automotive industry has done from a manufacturing standpoint. So being able to leverage some of that expertise to the rocket business is actually very helpful."